Prime Stage Theater and the Holocaust Center of Pittsburgh use the arts to examine hate with Teaching the Holocaust through Theatrical Arts. 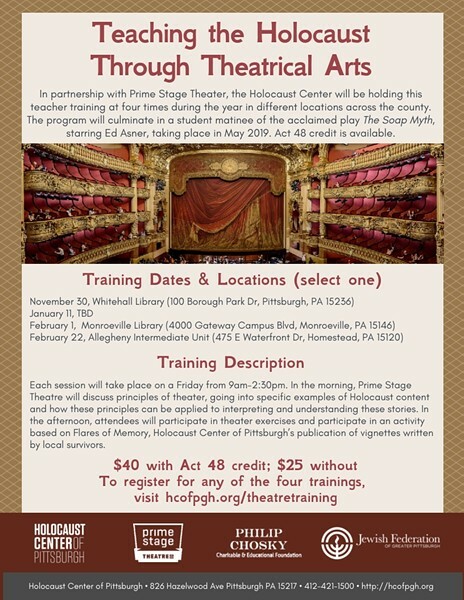 The four-part training series applies the principles of theater to interpret and understand the Holocaust. The event includes theater exercises and activities based on Flares of Memory, a collection of vignettes written by local survivors. The series concludes with a student matinee of The Soap Myth starring Ed Asner, taking place in May 2019. The first training session takes place at Whitehall Public Library.